RES-17000 Color: Red Features: -Large glass lid, cool touch knob and steam vent included. -Perfect for frying, grilling, roasting, stewing, baking and even making pizza. -Cool touch handles. -Large capacity non stick cooking surface and easy cleaning. -Vent holes release excess moisture keeping glass clear. -Tempered glass lids allow for easy viewing while cooking. Material: -Metal. 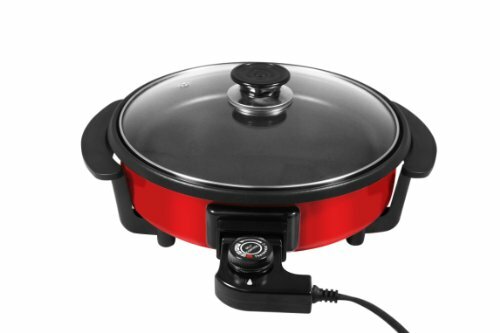 Product Type: -Electric skillet. Dimensions: Overall Height - Top to Bottom: -6". Overall Width - Side to Side: -14". Overall Depth - Front to Back: -12.5". Overall Product Weight: -4.6 lbs. If you have any questions about this product by Ragalta, contact us by completing and submitting the form below. If you are looking for a specif part number, please include it with your message.